Today was to have been the first day of post-Brexit Britain – 29 March, long-heralded by many as "Independence Day". With the divorce deadline extended, the uncertainty continues to divide. Brits are increasingly anxious – and even angry, with Leave voters marking "Brexit betrayal day". Nearly three years after the divisive referendum that saw 52 percent of voters back leaving the EU, Britain's MPs are at a loss on how, and even whether, the UK can properly leave the bloc. MPs on Friday rejected Prime Minister Theresa May's EU divorce deal for a third time, opening the way for a long delay to Brexit, or a potentially catastrophic "no deal" withdrawal in two weeks. The EU responded by calling an emergency meeting on 10 April, but have warned that a no-deal scenario is increasingly likely. The British pound dipped below US$1.30 after news of May's latest defeat. The European single currency meanwhile rose as high as 86.50 pence. 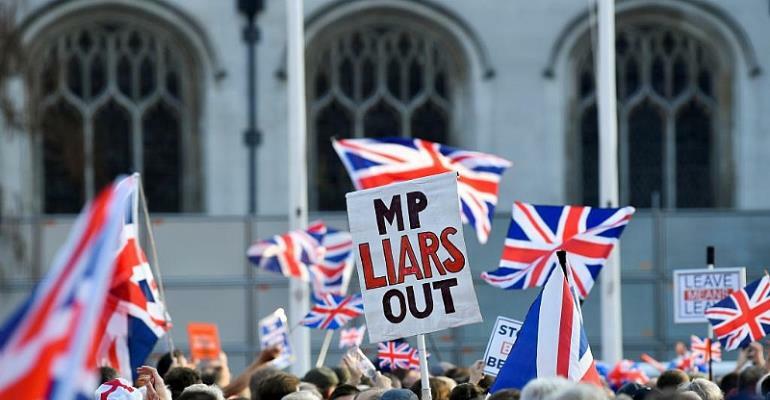 Thousands of Leave voters gathered outside parliament in London on Friday to express their anger at what they described as a "betrayal", holding placards reading: "Trust in politicians is dead". "There has been political chicanery and obfuscation by a bunch of rich idiots failing to do their jobs", John Abbott told AFP. The 37 year-old travelled from Nottingham in the Midlands to join the protest. Meanwhile, the anti-Brexit campaign group "Border communities against Brexit" has planned more demonstrations in Newry, Northern Ireland on Saturday. Local MLP Conor Murphy told Newry.IE website, “People right across society have been clear in their opposition to Brexit... We are at a crucial time in the Brexit process. It's important that people make their voice heard and send a clear signal to the British government." French customs officials are continuing their industrial action over the weekend at the Eurostar train terminal in Paris. The strike, which began on 4 March is currently open ended. The union is asking for more pay to justify the extra checks they will have to do when Britain leaves the EU. There are reduced services and delays to be expected between Paris and London. Are French and Irish ports ready for Brexit? The French ferry firm Brittany Ferries on Friday launched the first of its extra services as par of a contract to ship critical products to Britain in the event of a no-deal Brexit. The company will run 20 additional weekly cross-Channel sailings to transport essential goods like medicines and ease pressure on Dover, the busiest of England's Channel ports, in the event of a no-deal Brexit. Meanwhile, a newly-built "Brexit buster" cargo ship will set sail from Dublin for the first time on Friday bound for the Belgian port Zeebrugge, allowing Irish exporters to Europe to bypass Britain if necessary. An Italian anthropologist is touring London on a red double-decker bus on a mission to capture the capital's views on Brexit in the middle of an unprecedented crisis. Domenico Sergi, 39, said that during his research for the Museum of London, many of the people interviewed admit to suffering from "fatigue". "Brexit Talks" is one part of a four-year Curating London Programme funded by the Arts Council and Sergi hopes it will educate future generations of Londoners about a historic moment in the city's history. "People feel overwhelmed by the public discussion and are a little bit puzzled about the confusion taking place all round them," he told AFP in an interview during a visit to Brunel University, located in high-profile Brexiteer Conservative lawmaker Boris Johnson's constituency. Bars and nightclubs in Remain-dominated London laid on a host of Brexit-themed parties on Friday to celebrate the non-event. A club in Bethnal Green in the capital's east promised "bonkers Brexit cabaret" with appearances by characters including "Monster May". Elsewhere, the Church of England invited parishioners to sit down for a cup of tea and a chat over the weekend in a bid to forge some unity. Suitable Bible passages and newly-composed prayers will be chosen under the slogan "Together" to prompt the faithful whatever their views about leaving the EU to start conversations.